The recipient of an email message from you cannot see you. She cannot see you smiling. She cannot see you frowning. All of the essential nonverbal communication that takes place when you talk to someone is missing in an email. And, as we all know, more important than what you say often is how you say it. The information encoded in the tone, expression, and gestures are lost. They are "undercover." If all the undercover information that goes with a message is missing, we risk a formidable misunderstanding, especially when the email is personal. Misunderstandings can always happen, often they are funny, but they can also make life extremely difficult. When you write an email, you can use language to express your feelings. Depending on how gifted you are as a writer, your success in conveying your feelings will vary. Using language is difficult when it comes to emotions. That's why a shorthand has developed. 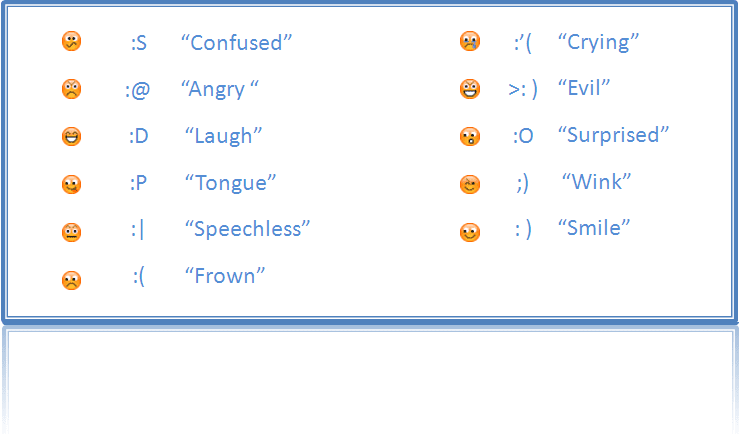 They are called emoticons or smileys, and they offer a great way to convey emotions via email. Using an emoticon like, ";-)" means something like a wink and indicates that you've just made a funny or a slightly sarcastic remark. Take a look at the emoticon: ;-) It looks like a smiling, winking face. If you don't see that at once, try tilting your head to the left a bit. The most basic emoticon is the simple smiley: :-) It indicates that you are smiling and happy about what you have just said. Another essential emoticon is the frowning face: :-( Hopefully, you don't have to use that too often, as it stands for sadness and shows you're unhappy about what you have just said. In between the smiley and the frowning face is the following emoticon: :-| It indicates indifference and that you don't care. A fourth emoticon that you can probably use is the laughing face: :-D Let's hope you get a chance to employ it often.